AAICLAS is 15-12-2018. Application form attached with notification. Must have attach the DD and self attested copies along with application form. AAI Security Screeners recruitment will be based on physical tests, written exam and interview. Only shortlisted candidates are called for physical tests to their respective regions for the selection of AAICLAS Security Screeners Recruitment 2018. 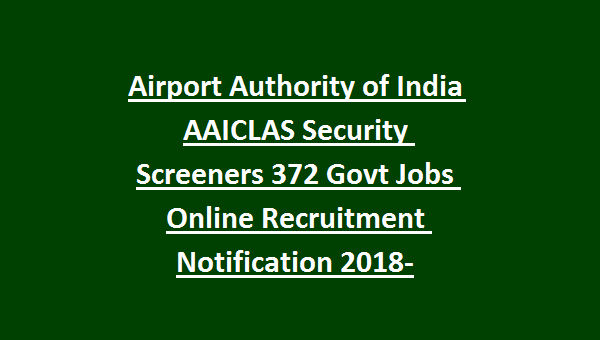 Physical Test Details, Exam Pattern, qualifications, salary and other details about AAI Security Screeners Recruitment 2018 Notification. 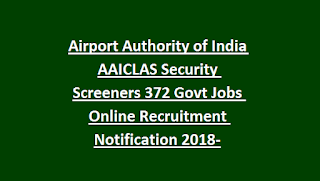 There are total 372 Security Screeners vacancies available in this AAICLAS recruitment 2018. Any 3 years Degree qualified candidates are eligible to apply. First Preference will be given to AVSEC candidates. Salary is Rs.25000-35000/- and allowances will be given to the candidates who is having BVSEC or XBIS certification. In 3 years contract period candidates have to undergo for one year probationary period. Fee to be paid through DD ‘AAI Cargo Logistics & Allied Services Company Limited’ payable at ‘New Delhi’. Candidates selection will be based on Physical Tests, Written Exam and interview. For BVSEC candidate no physical tests or written exam only interview will be conducted. For BVSEC certificate having candidates no physical tests. For others 100 meters running to be completed in 16 seconds or 1000 meters running to be completed 4.5 minutes. Physical test qualified candidates are only eligible for this written exam. Candidates written exam will be conducted for 100 marks. Submission of application form to AAICLAS before the closing date of 15-12-2018. Application form is available for download at www.aaiclas.org. Along with application form must have submit the all required documents.